Featured: Sharjah Declaration on NCDs for Children News: Managing Conflict of Interest in the Caribbean; HCC Childhood Obesity Webinar Series; Vegetable Harvest at Gambier Primary School, Bahamas; The Bahamas Healthy Lifestyles Team (HaLT) Setup Their First School Vegetable Garden; Physician Groups Call for Taxes and Regulations on Kids’ Access to Sugary Drinks; Obesity-Prevention Efforts by No Means Diluted; Screening Important Says Cancer Support Services President; Join the New HCC Facebook Group; Doctors Get Training in Early Detection of Heart Diseases; Antigua and Barbuda Looking to Become Region’s First Wellness Destination; Stressful Life Events Tied to Heart Disease in Older Black Women; New Funding Opportunity from the LINKS Initiative; Children’s Chances of Surviving Cancer Less Than 30% in Poor Nations – Study; Obesity News from Across the Globe; PAHO Alcohol and Health Webinar Series 2019; The American Heart Association Institute for Precision Cardiovascular Medicine Data Grant Portfolio; Please Help to Monitor the Health of Caribbean Schools; Key Messages From Our Publications; NCD Alliance Newsletter; COPS; Forthcoming Events; Our Publications Read more…. Featured: HCC NCD Youth Advocates Represent the Caribbean at Global NCD Forum on Children and Youth in Sharjah News: Big Win for Bermuda: Sugar Tax of 75% on Target for on April 1 and Chocolate Bars Added to the List; Heart & Stroke Foundation of Barbados Op Ed on Childhood Obesity and NCDs; New Study Links Higher Sugary Drink Consumption With Increased Risk of Death; Join the New HCC Facebook Group; Noncommunicable Diseases Among Women: A ‘Slow Motion Disaster’; High-Risk HPV Testing Coming to Public Health Facilities in Trinidad and Tobago; Barbados PM Push for Healthier Options on Menus; The Caribbean – Change of Diet; Heart Disease and Depression: Scientists Find Missing Link; Obesity News from Across the Globe; How Flavoured Water Got Britain’s Juices Flowing as a Healthy Alternative to Sugary Fizzy Drinks; Sitting Disease: Too Much Sitting at Your Office Desk is The New Smoking; PAHO Alcohol and Health Webinar Series 2019; ECHORN/Yale TCC Webinar: Developmental Origins of Non-Communicable Diseases: Can Early Life Interventions Change the Story? ; The American Heart Association Institute for Precision Cardiovascular Medicine Data Grant Portfolio; Please Help to Monitor the Health of Caribbean Schools; Key Messages From Our Publications; NCD Alliance News Letter; Forthcoming Events; Our Publications Read more…. Featured: Barbadians Looking for Government to Take Action on Childhood Obesity News: Bermuda Minister of Health Defends Sugar Tax; 81 per Cent of Jamaicans Support a Tax on Sugary Drinks; Heart Foundation of Jamaica (HFJ) Facebook Live and Twitter Chat on the Sugar Tax;# Christopher Tufton – Diluting Sugar; 87% of Barbadians Will Die From Non-Communicable Diseases by 2030; Is Sugar the New Tobacco? ; 7 Issues Gaining Momentum in Global Health; Community on Women and NCDs Webinar; CARPHA Meets with Regional Stakeholders to Discuss Post Market Surveillance for Medicines; Lancet Articles; Coca-Cola Admits It Produces 3 Million Tonnes of Plastic Packaging a Year; PAHO Alcohol and Health Webinar Series 2019; ECHORN/Yale TCC Webinar: Developmental Origins of Non-Communicable Diseases: Can Early Life Interventions Change the Story? ; The American Heart Association Institute for Precision Cardiovascular Medicine Data Grant Portfolio; Please Help to Monitor the Health of Caribbean Schools; Key Messages From Our Publications; NCD Alliance Newsletter; Forthcoming Events; Our Publications Read more…. Featured: International Women’s Day 2019; The Campaign Theme This Year Is #BalanceforBetter; HCC Executive Director Member of Steering Group for New Online Community on Women and NCDs; Celebrating Women Leaders in Science and Health News: CARICOM Member States discussing ‘HIGH IN’ Front of Package Labelling; Cervical Cancer Could Be Eliminated in Most Countries by 2100 According to New Research; The Heart Foundation of Jamaica Calls Upon the Government to Honour it’s Sugar Tax Commitment; Caribbean Fruits and Vegetables Infographics Now Available in Multi-paged Printable Versions; Barbados National Workplace Wellness Policy; BNR Celebrates 10 Years With Extravaganza; PAHO Alcohol and Health Webinar Series 2019; South Africa – Obesity – What’s in my food? ; Cancer Support Services First PSA Screening for 2019; The Hidden Problem That Drives 100 Million People Into Poverty; The American Heart Association Institute for Precision Cardiovascular Medicine Data Grant Portfolio; Lake Health and Wellbeing Newsletter; Please Help to Monitor the Health of Caribbean Schools; Key Messages From Our Publications; NCD Alliance Newsletter; Forthcoming Events; Our PublicationsRead more…. Programme Assistant – HSC; WHO: Advisor, Health Economics and Financing; University of the West Indies Cave Hill Campus; Please Help to Monitor the Health of Caribbean Schools; Key Messages From Our Publications; NCD Alliance Newsletter; Forthcoming Events; Our Publications Read more…. Featured: Front-of-Package Labelling Takes Centre Stage at National Consultation on CARICOM Regional Labelling Standard for Prepackaged Foods in Barbados; Study Suggests Innovative Chilean Food Regulations Are Changing Food Perceptions, Norms, Behaviors News: HCC Consultancy Opportunity; Cervical Cancer Third Most Common Cancer Among Women In Latin America and The Caribbean; HaLT (HeAlthy Lifestyles Team) of the Cancer Society of The Bahamas Continue Their Mission for Better Health; Plain Packaging on Cigarette Packaging to Be Introduced in Singapore; Multisectoral Action Plans in the Caribbean; CARPHA and Agence Française de Développement (AFD) Sign Agreement to Strengthen Regional Health Security; More Breast Cancer Research Needed for Susceptible Caribbean Populations, Study Says; Barbados ‘Off’ Sodas; St. Kitts & Nevis Will Use Taxes on Alcohol, Sugar Sweetened Beverages (SSBs) and Tobacco to Help Fund Universal Healthcare; Global Hearts Initiative Trinidad & Tobago; Coke Stock Has Worst Day in 10 Years; NCD Alliance: Bolstering Accountability Must Be Our New Year’s Resolution for 2019: 9 Tools to Help; Eating ‘Ultraprocessed’ Foods Accelerates Your Risk of Early Death, Study Says; Artificially Sweetened Drinks Linked to High Risk of Heart Attack and Stroke; Latest PAHO “Basic Indicators” Shed Light on Health Situation in the Americas; Interesting Reading; Obesity News from Across the Globe; Please Help to Monitor the Health of Caribbean Schools; Key Messages From Our Publications; NCD Alliance Newsletter; Forthcoming Events; Our Publications Read more…. Featured: New Evidence Shows Barbados SSB Tax Is Working, but Also Suggests It Could Do Better: Implications for Designing SSB Taxes News: HCC Consultancy Opportunity; National Consultation on Prepackaged Food Standards; Jamaica to Receive Support From India to Combat NCDs; Belize Cancer Society World Cancer Day; More Breast Cancer Research Needed for Susceptible Caribbean Populations, Study Says; BNR Registry; Obesity News from Across the Globe; Please Help to Monitor the Health of Caribbean Schools; New United Nations Holiday, World Pulses Day; Key Messages From Our Publications; NCD Alliance Newsletter; Childhood Obesity Prevention Scorecard; Forthcoming Events; HCC Publications Read more…. Featured: World Cancer Day 2019; Let’s Eliminate Cervical Cancer; Read More About Our Award Winning Work in Cervical Cancer Prevention; CARPHA Media Release: Healthy Choices and Early Detection can Reduce Your Risk of Cancer; Cancer Organisations Across the Region; WCRF; The Lancet Global Health News: Sugar-Sweetened Beverage (SSB) Sales in Have Fallen in Barbados Since Introduction of 10% Tax on SSBs; Lancet Commission on Obesity – Report Launched; World Cancer Research Fund International Report; Caribbean Well Represented at The PMAC Conference: The Political Economy of NCDs; KPMG Donates Funds to the Barbados Cancer Society; Trinidad & Tobago Has a Big Problem and it’s Growing; Coca-Cola Tried to Influence CDC on Research and Policy; Obesity News from Across the Globe; Solutions for Non-communicable Disease Prevention and Control; Please Help to Monitor the Health of Caribbean Schools; NCD Alliance Newsletter; Lake Health and Wellbeing January Newsletter; Cervical Cancer Prevention Initiative New Brief; Childhood Obesity Prevention Scorecard; Forthcoming Events; Key Messages From Our Publications; HCC Publications Read more…. 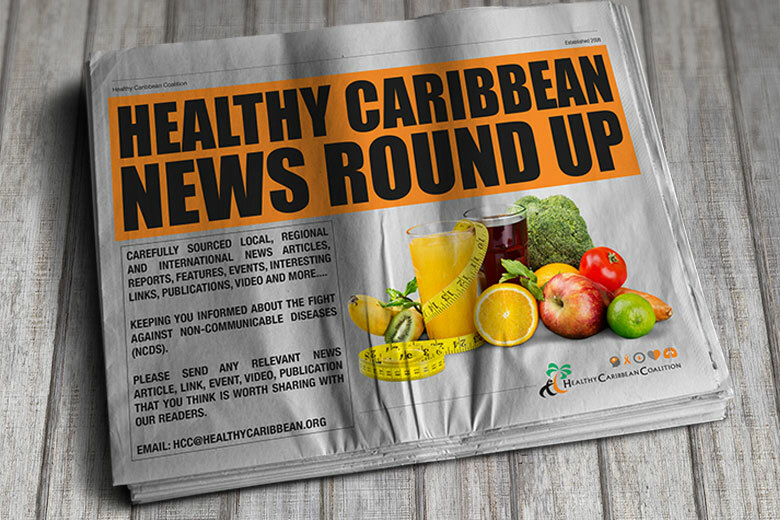 News: The New Canada’s Food Guide; Public Sector Entities Implementing Wellness Programmes; World Cancer Day February 4th 2019; D-Foot Implementation Summit; The Global Commission on the Future of Work Calls for Fundamental Changes in Health at Work; Change to the Definition of Palliative Care; Please Help to Monitor the Health of Caribbean Schools; Barbados Ministry of Health Calendar of Events 2019; WHO Publish Reports on NCDs; Cardiovascular Risk Reduction in Diabetes Webinar; NCD Alliance Newsletter; Childhood Obesity Prevention Scorecard; Key Messages From Our Publications; HCC Publications Read more…. Featured: There is Still Time to Influence the CROSQ CARICOM Regional Labelling Standards National Consultations; Caribbean Making Bold Moves to Tackle Obesity – Two More Countries Announce Sugar Taxes News: 4,000 Adults To Take Part in the 2019 STEPS Health Survey in the Bahamas; Dominica Diabetes Association (DOMDA) Tackles Obesity; Please Help to Monitor the Health of Caribbean Schools; Improve Diets Now for Better Personal and Planetary Health – Lancet Report; NCD’s High on the List of WHO Ten Threats to Global Health in 2019; Foods That Can Ward off Non-communicable Diseases; Cardiovascular Risk Reduction in Diabetes Webinar; Specialist, Communications for Health Promotion; Trinidad & Tobago Dietary Assessment Study; Coca-Cola Influences China’s Obesity Policy, BMJ Report Says; NCD Alliance Newsletter; Childhood Obesity Prevention Scorecard; Key Messages From Our Publications; HCC Publications Read more…. Featured: CROSQ CARICOM Regional Labelling Standards National Consultations are Happening this Month News: Expert Forum – Sugar, Other Carbohydrates and Fats – Their Contributions to Obesity; Jamaica Drink Companies Urged to Speed Up Sugar-Reduction Process; Incoming CARICOM Chairman Commits to Combatting Chronic NCDs in 2019; WHO Study Likens Palm Oil Lobbying to Tobacco and Alcohol Industries; 12,000 Patients Seen as T&T North Central Regional Health Authority (NCRHA) Keeps ‘Walking The Talk’; Healthy Me… Healthy You… Healthy T&T; What Does It Cost to Have a Non-Communicable Disease? ; Cardiovascular Risk Reduction in Diabetes Webinar; Junk Food Ad Ban on London Transport to Take Effect in February 2019; New Index Measures How Companies Are Doing to Help You Eat Healthier; Specialist, Communications for Health Promotion; Trinidad & Tobago Dietary Assessment Study; NCD Alliance Newsletter; My Healthy Caribbean School; Key Messages From Our Publications; HCC Publications Read more….